Swindon Town have beaten fellow League One side Colchester United to the signing of Alfreton Town defender Aden Flint on a two-and-a-half year deal. The 21-year-old moves to the County Ground for £150,000, a club record fee for the non-league outfit. Swindon will also have to pay Alfreton 20% of any future sale. 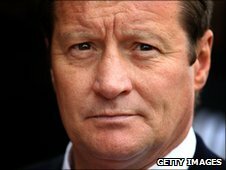 Alfreton had accepted offers from both clubs on Thursday and Flint had met U's boss John Ward the previous day but chose Danny Wilson's side instead. The 6ft 6in defender may not have played his last game for the Blue Square Bet North side and could be loaned back if first-team opportunities with the Swindon are limited. Flint arrived at the Impact Arena from Pinxton in the summer of 2008 and has been an integral part of Alfreton's charge to the top of the Blue Square Bet North. He has played 24 games this season scoring three goals for the East Midlands side. Flint is Swindon's first new face in the January transfer window and bolsters their defensive unit with Sean Morrison having signed for Reading.